Couldn't resist taking some pictures yesterday as the color of the turf was outstanding. It was just one of those days when the lighting was perfect, but also this week we sprayed fairways with fertilizer and fungicide so they were just beaming. All the oak leaves are down and the staff has done an awesome job getting it picked up. The golf course has such an open feel during the winter months with the oaks defoliated. Some vistas open up that are just beautiful. Check out this pic from behind 16 green. I took this picture on 7 and 17 tee to show how the new tees have really come in nicely during this wonderful fall weather pattern. The older turf and the new turf look pretty similar right now. 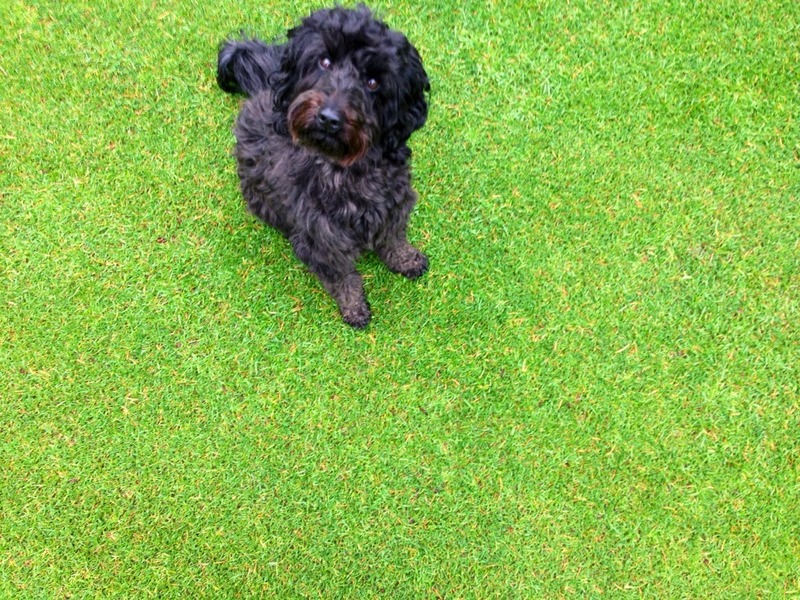 The turf on the new tees is so good that we've now put them into play almost full time. It's good turf, but obviously still not as fine texture or tight as the Poa turf that covers the majority of the property. Getting turf to look like that takes time. Anyway, I was out taking pictures and came up to number 6 which is always good for a nice photo opportunity. Here she is and once again she didn't disappoint. #6 is such a good looking golf hole and very fun to play. One of the very interesting things about her though is although the course has been rerouted since the original layout, this hole has always remained #6. The same goes for #7 and #8. Those holes also have always had the same number. So anyway, most of you know the teeing grounds for #6 have changed over the years, but I bet none of you know the green location has also. I discovered this at the same time I discovered the original location for the 18th green. You can refer this past post for more details on that by clicking here. 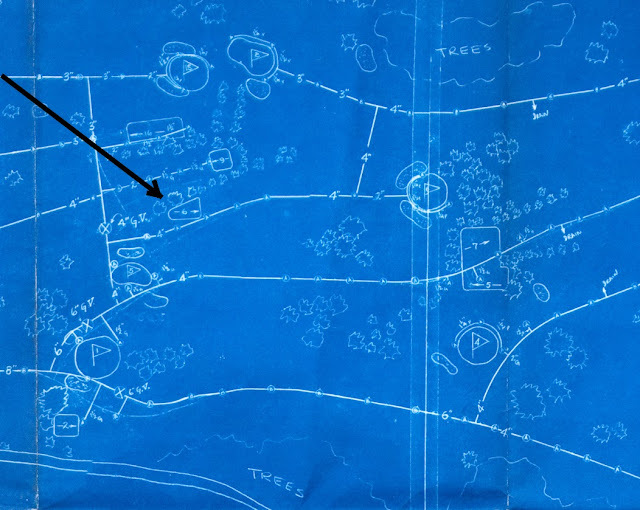 The discovery of this old map is how I learned of the original green locations. This map is an as-built for the installation of the wood stave pipe in 1923. 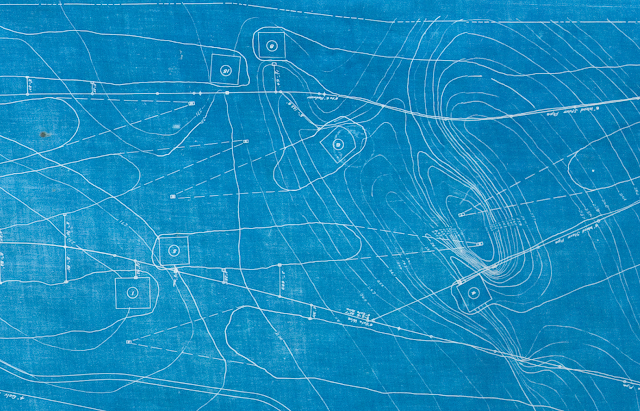 It is the oldest known diagram of the course routing. So in the image above you can see how the routing once was in the center of the course. This next image has lines on it to help you see how the 6th hole has changed throughout time. Obviously the black line is the route on this map and so this is how the hole played in 1923. I'm uncertain when the green was moved but the red line shows how the hole was played when the green was relocated. 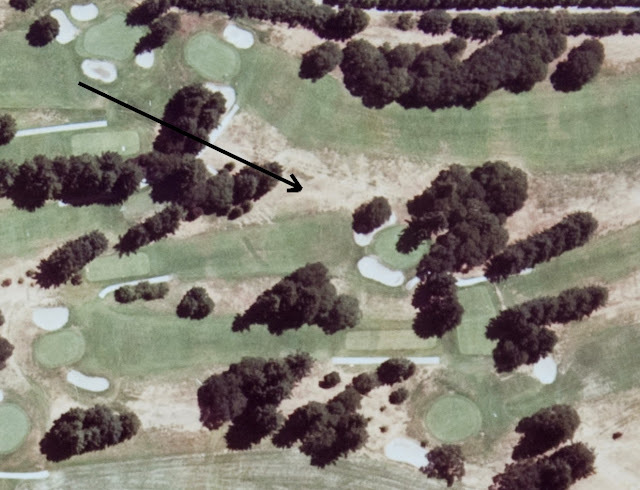 The green line shows how the hole was played after the rerouting in 1989 and up until today. 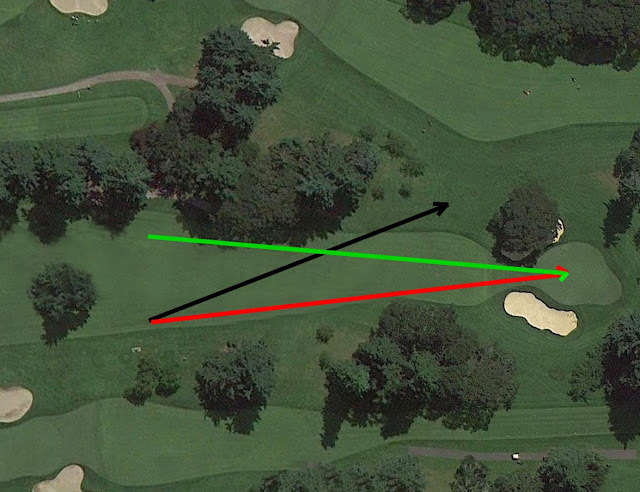 Of course since the recent renovation, we now can play the hole again on the old route shown with the red line. Here is those same lines laid out on the aerial of the hole today. Now look back up at the 1923 image. If you understand how contour lines work, then you can see the hole played more downhill in the years around 1923. Now this old picture which I found in the history book makes more sense. This is the oldest know picture of #6 and I was always perplexed by it because it is obviously more downhill then today's hole. For a long time I just assumed the hole was reconstructed at one time and a bunch of dirt was brought in to build up the green to where it is today. But now I know this picture was just taken during the time when the green was in the other location. Here's a picture from this same spot today. If you go over to this area which is to the left of the current green, you can see this is a really nice level spot and it was probably a great little short hole. Here is how this area looks from the old teeing ground. So you can see this hole played down hill with a really cool view in the background. That hole in the background is number 8. According to the history books, number 8 was once named Mt. Rainier because there was such a great view of the mountain. 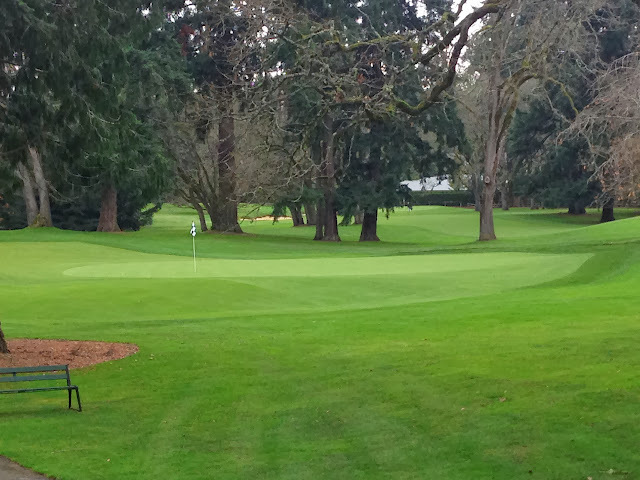 Today, none of the holes at Tacoma C&GC are named, and there is hardly a view of anything since all the trees have grown. 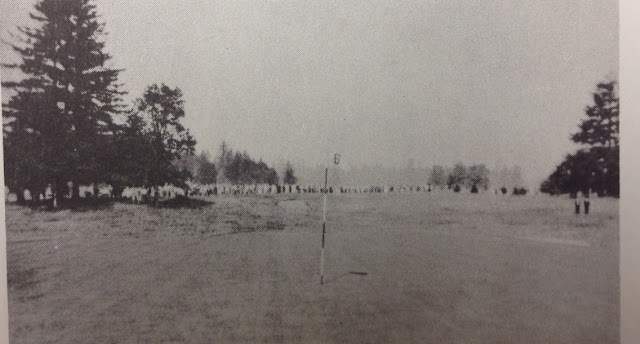 The original layout was an inland links style course laid out on an open prairie and apparently there was wonderful views. 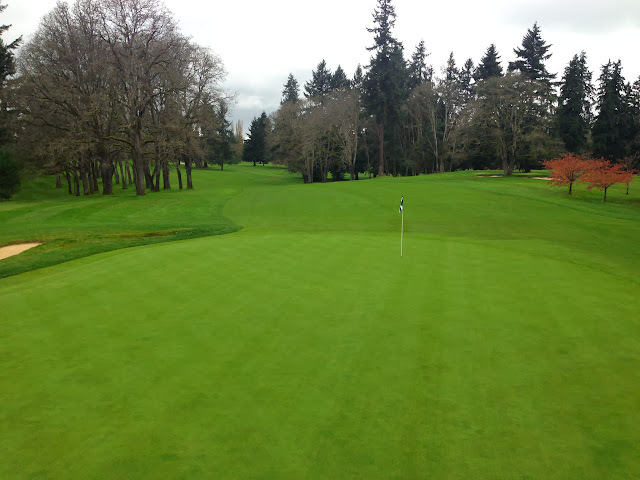 The original angle of #6 as you see above was played from one of the highest points and looking out toward the cascade mountain range. I can only imagine how beautiful the view was from this tee in those days. 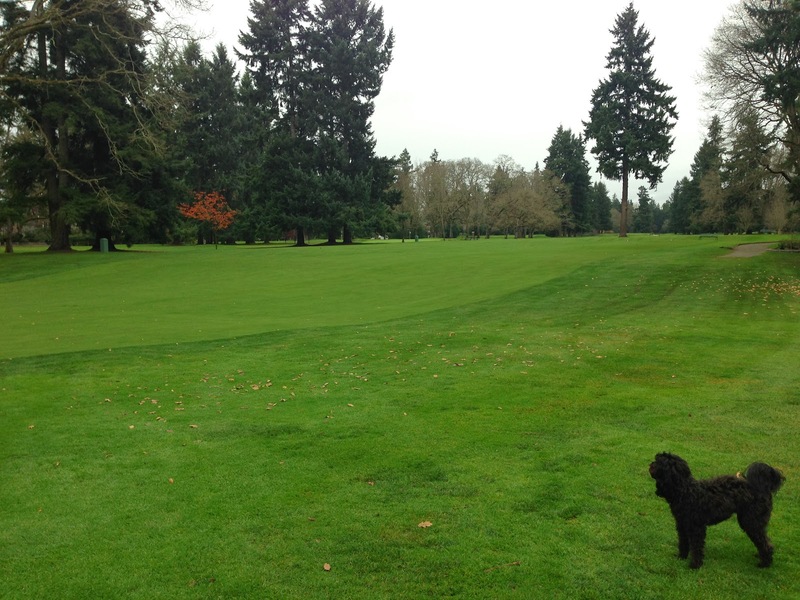 But anyway, at one time the decision was made to relocate the green to where it is today. Perhaps it was because long shots would go into those folks playing number 8. 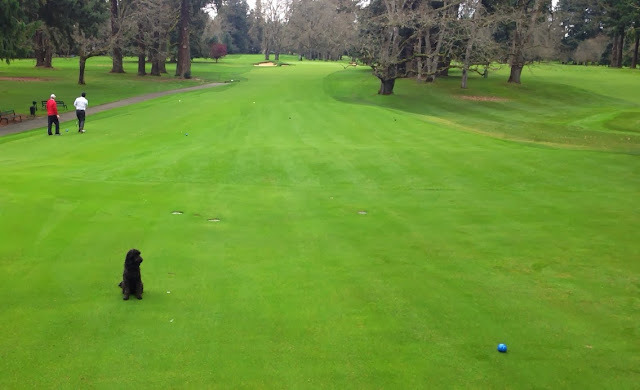 Or maybe it was simply to add length and get the green closer to the 7th tee. There was probably several reasons to relocate the green, but I still have yet to find out when the work was done. Check out this old map. This is the 1953 as-built for the installation of the concrete asbestos mainline. You can see at this time the green was moved to it's present location. But check out the tee. 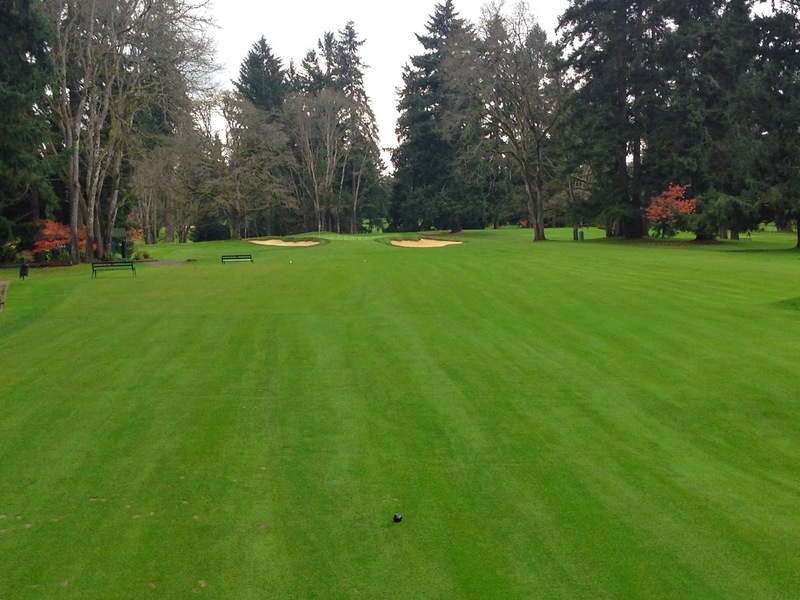 It still has the angle in its shape pointing that left edge toward the original location of the green. And here also you can see the trees planted in such a way that points the hole out on the original angle. So obviously the hole was altered between 1923 and 1953. I hope someday to narrow it down better than that. Look at this old aerial from 1979. You can really see how the tree plantings point to the original routing of the hole but at this time it looks like there is no evidence that the green was ever in the original location where the arrow is pointed. Now below you again see how this area looks today. There is hardly any evidence that the original green was once to the left of the oak. Today, following the renovation, the teeing ground was restored to what it was like in 1923 since originally that area was treeless. That's pretty cool. 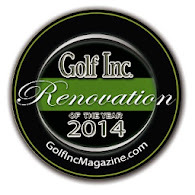 Also, we now have the ability to play the hole as it was after the green was moved but before the rerouting in 1989. That is also pretty cool. 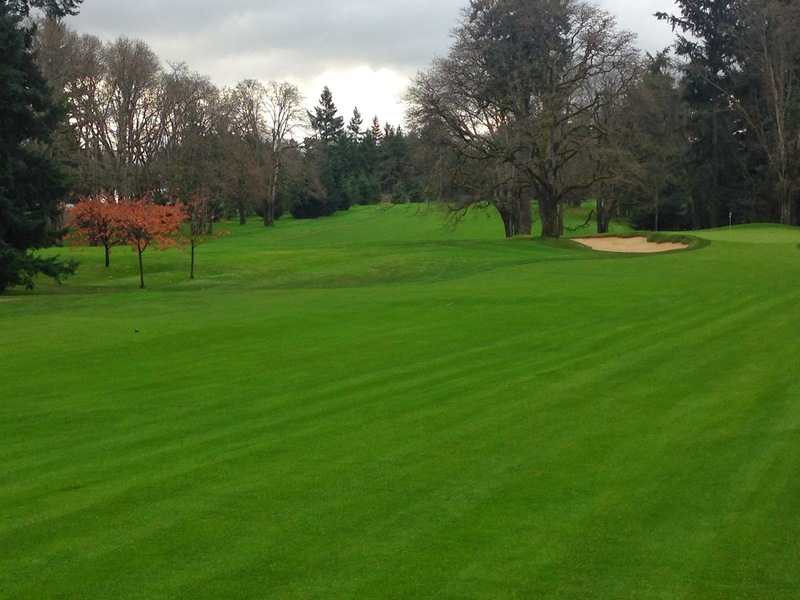 Bottom line is #6 at Tacoma is a great hole with some interesting history. I feel good knowing that now with this blog, the recent restoration project, and overall renewed interest in the Club's rich history, everyone will know that the green once was in that nice flat spot off to the left.